Your BlackBerry can be a lifesaver if you want to know the name of that song playing in the bar or want to find out the time for the next showing of that new blockbuster. 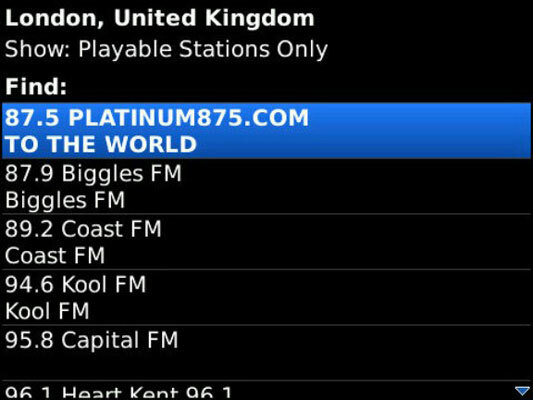 These apps can also bring the radio right to your BlackBerry — and recommend songs for you to listen to. 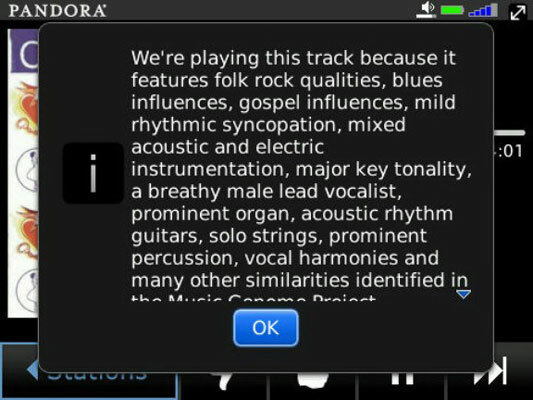 Think of Pandora for BlackBerry as your personal electronic disk jockey that starts with a few songs or artists you like, and then searches out and finds music that is similar or shares certain attributes. You get to create and fine-tune your own “stations.” You’re allowed as many as 100 channels, and you can pick just one to play, rotate through them all, or ask the computer to choose pleasing songs at random. 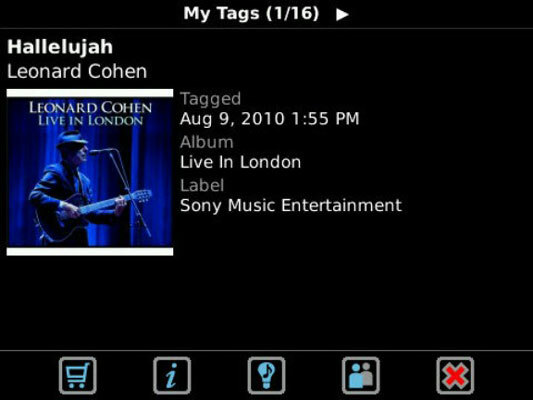 Your BlackBerry will display a picture of the album or CD cover. And if somehow Pandora casts a swine amongst the pearls, you can remove it from the mix with a click. The more feedback you provide, the better the electronic DJ gets to understand your ear. Shazam is a musicologist in your pocket. Turn it on, aim your BlackBerry toward the speakers of your stereo, the background music in a bar, or the fuzzy noise in an elevator, and give it a few seconds to listen and then think. Like magic, there on the screen of your BlackBerry — almost without fail — you see the name of the song, the artist performing it, and the album on which it was released. Want more? How about a biography of the performer, a listing of songs recorded, and access to YouTube and other videos about the singer. And, if you have the Encore version, you can even download a Tag Chart that tells you what the rest of the world, or at least those who are using Shazam, are currently tagging and grooving to. For certain artists and songs — depending on copyrights — you may be able to download the lyrics. And you can also obtain a list of other artists and albums that contain a particular song — by the songwriter or covers by others. Nobex Radio Companion uses your BlackBerry to connect to the Web and from there tap into any of a stream of perhaps 5,000 radio stations from more than 80 countries around the world. The app comes with a few sample stations, but the real power comes when you choose to add your own spectrum of sound. You can look at the entire list, or you can ask for a display by genre: rock, country, talk radio, oldies, and many other categories. You can also consult Nobex’s Web site on a computer to see a map of available stations. 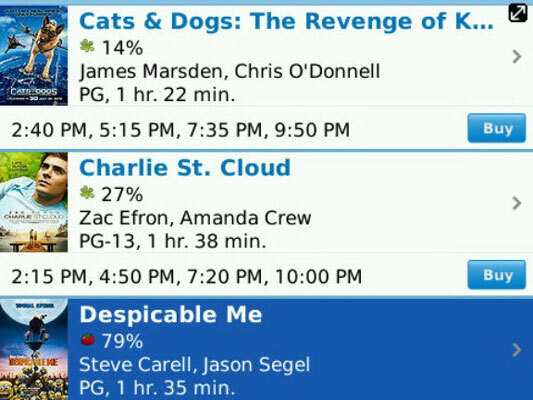 The Flixster app offers a BlackBerry version of the Flixster Web site’s movie listings. You can choose a movie and find out where it’s playing, or you can ask to see what’s playing at theaters near you. There’s just about every bell and whistle a movie lover could want: descriptions of new films, video trailers, photos, a cast list, and a listing of theaters. You can check out which films are box-office hits, and you can read brief snippets of reviews by professional critics or venture into the amateur world of social networking and find out what your fellow Flixster viewers think. The BlackBerry version of Moviefone includes the basic elements: movie listings, trailers, and showtimes what’s playing at theaters near a Zip code you enter. You can also see the movie’s poster. One feature it offers not matched by many other services: the ability to order and pay for tickets online at some participating theaters. You don’t get reviews of the films, other than an unexplained star rating. And the app does not use the GPS in the BlackBerry, although it’s not a huge issue to enter a Zip code. However, it only seems to show theaters within a few miles of that point.